Contact us for a fast free quote. Our quotes are comprehensive, detailed and aim to leave you care-free… Let us take care of all of the details, including lift equipment rentals, loading, strapping, unloading, transportation, etc. We have crews of certified fork lift, scissor lift and reach operators and can even unload and reload racks if needed! For more info please go to 'Guidelines for Pre-Start Health & Safety Reviews'. Changing the level of a beam by only a few inches can change the load handling specifications of a racking system by thousands of pounds. Engineers design racking systems starting with your load specifications and preferred layouts, and consider beam levels, cross-section size, length, gauge of steel used, height of frames and a variety of other factors to create the appropriate configuration. Changing rack configurations (beam levels other than the original supplier- engineered) requires a pre-start safety inspection. 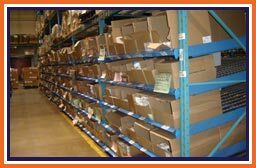 Under Ontario law, warehouse equipment operators loading and unloading racks must receive documented trained in the proper use, maximum loads, etc. 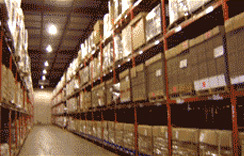 of a racking storage system.